These easy homemade chocolate candies are perfect for Valentines Day and Christmas. Hi everyone!!! Valentine's Day is just around the corner. Only six more days left if you're counting. Are you ready? When it comes to ♥ Valentine's Day ♥ is all about spoiling your family and loved ones. Today I wanted to share two yummy homemade creations that I think will be perfect for that special someone in your life. You can always buy store bought chocolates, but you can bet that they will be ridiculously overpriced for even the smallest of boxes. Why not make them yourself instead. Don't worry it's a lot easier than you think. Not to mention the person that you are gifting these yummy little chocolates to will love them. Especially when they find out that you made them yourself. If I know one thing peanut butter and chocolate go together just like peas and carrots. A perfect match made in heaven if you ask me. When I was thinking of a sweet treat to make for Valentine's Day, Chocolate Buckeyes was the first candy that came to mind. Most folks usually make these at Christmas time, but they are also perfect for Valentine's Day. Line them up in a pretty heart shaped or valentine themed box for a simple yet pretty gift. Instead of just one chocolate treat why not make a variety. I chose Crock Pot Chocolate Candy for our second Valentine treat. Making Candy in your crock pot is really simple. The only thing you need to keep in mind is the temperature. You don't want to cook it too high or you will scorch the chocolate. Just remember low and slow and you will be fine. Over the Christmas Holiday I made some Chocolate Pecan & Chocolate Crispy Candy Cups. They turned out really good and everyone loved them. But it got me thinking how would they taste if I mixed in some vanilla along with all that chocolate? Well no time better than Valentines Day to find out. With my crock pot in hand I mixed and melted all the chocolates together. Semi Sweet, German, Chocolate Almond Bark and Vanilla Almond Bark. I have to say the combination was out of this world good!!!! 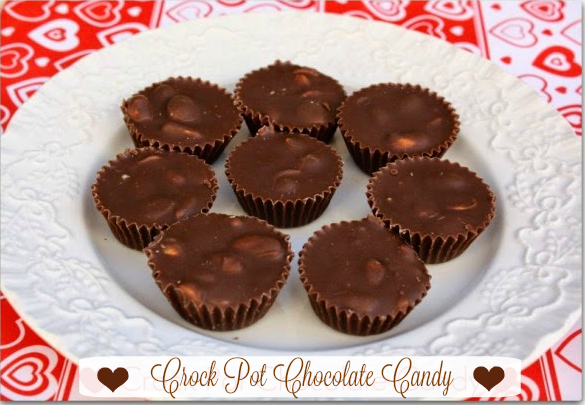 I have included some step by step photos below of this easy crock pot chocolate candy. To me the vanilla bark mellowed out all that chocolate perfectly. I think I have found a new favorite way to make homemade candy y'all. I added dry roasted peanuts to mine, but feel free to use your favorite add in's. Using a 2 or 4 quart size crock pot. Add the chocolate chips, milk chocolate almond bark, German chocolate squares, vanilla almond bark and peanuts. Set the temperature on your crock pot to low. Cover and cook for 2-3 hours without stirring. When the chocolate is completely melted stir to combine. Drop the candy by tablespoons into cupcake lined mini muffin tins. You can also use regular muffin tins and use about 2 tablespoons of the chocolate mixture. Allow the candy to cool before removing the paper liners. 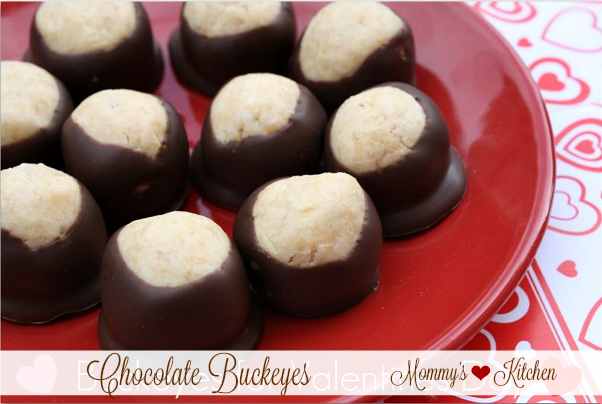 These yummy little buckeyes start with creamy peanut butter of course. Look at my cute little Gooseberry Patch measuring cup? I have the whole set and indeed they are my favorite measuring cups that I own. OK lets get started on making some buckeyes. In a large bowl combine the confectioners sugar, butter, peanut butter, and vanilla. Mix well. (I used my hand mixer). 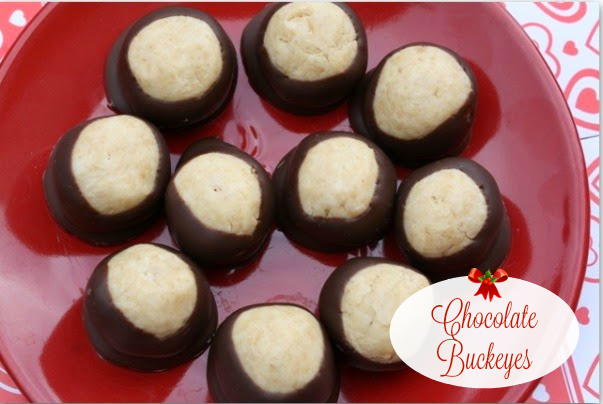 I also used my small cookie scoop to make the buckeye balls. Scoop out one scoopful of the peanut butter mixture. Roll into small balls and place on parchment paper, waxed paper or foil. Place the balls in the freezer and freeze for 2 hours. Melt the chocolate bark in the microwave for 3 minutes on the defrost setting. Continue in 3 minute intervals until the chocolate is completely melted and smooth. Using a toothpick dip each ball into the melted chocolate about 2/3 deep. Leave a portion of the peanut butter showing. Set on parchment paper to cool completely and harden. Once they chocolate hardens dig in and enjoy!!! In a large bowl combine the confectioners sugar, butter, peanut butter, and vanilla. Mix well. Using a small cookie scoop to make the balls. Scoop out one scoopful of peanut butter mixture. Roll into small balls and place on parchment paper. Place the balls in the freezer for 2 hours. Melt the chocolate almond bark in the microwave for 3 minutes on the defrost setting. Continue in 3 minute intervals until the chocolate is melted and smooth. 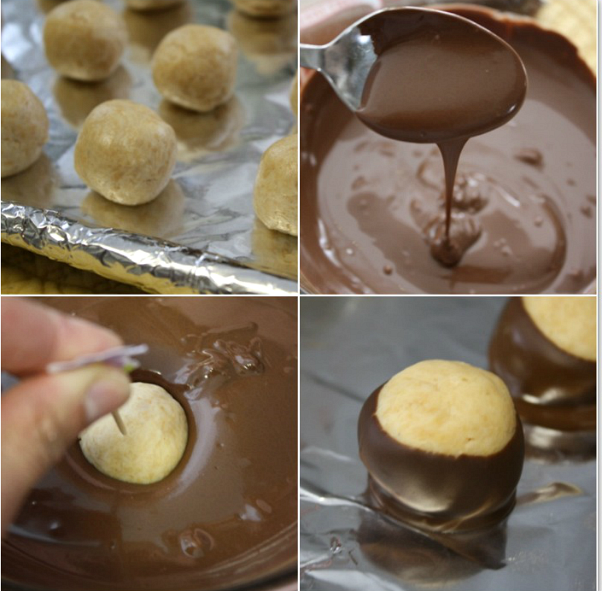 Using a toothpick dip each ball into the melted chocolate about 2/3 deep. Leave a portion of the peanut butter showing. Set on parchment paper to completely harden. Using a 2 or 4 quart crock pot. Add the chocolate chips, chocolate almond bark, German chocolate squares, vanilla almond bark and peanuts. Set the temperature on low and cover. Cook for 3 hours without stirring. When the chocolate is completely melted stir to combine. Drop the candy by tablespoons into cupcake lined mini muffin tins. 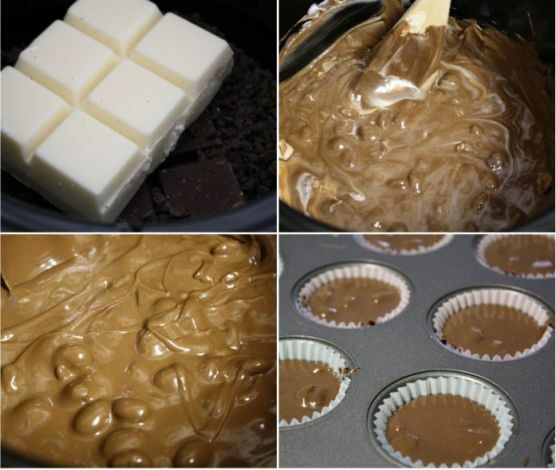 You can also use regular muffin tin and use about 2 tablespoons of the chocolate mixture. Allow the candy to cool before removing the paper liners. OMG those look delicious! And easy! I am making those this weekend. Yum!! I just love these treats, I just wish I didnt have to work out to enjoy them. Yes....I just made buckeyes for my superbowl party...they were yummy...I stuck the leftovers in the freezer and am still enjoying them!! I make homemade buckeyes also. I have tried several different chocolates & we prefer Ghirardelli. It melts very smooth (I use the microwave) & does not have a waxy taste some others do. I have also made them with chunky PB. We prefer the smooth. The milk chocolate almond bark never has a waxy texture to to me. I prefer the plymouth pantry chocolate bark to any other bark in the stores. making your buckeyes with my little guy today for valentine's day! thanks for the recipe! also, i've been making my own laundry soap for several months now - inspired by your post & others i found googling. i blogged about it last week & included the link to your recipe. thanks! What size crock pot do you use when doing chocolate? I made the crock pot candy at Christmas but the recipe I used called for 1 jar salted & 1 jar unsalted dry roasted peanuts. It was just the right amount of nuts for all the chocolate. Really a big hit. It all depends on how much peanuts you want. That is why it is noted "more if you prefer". @Cindy, I would just do plain chocolate without nuts or add raisins or even rice crisps. Rice crispys are really good they end up like a crunch bar. I make the crock pot candy but just drop it onto wax paper instead of in muffin tins. Neat idea though if I had a mini muffin pan!